The pleasure of good food à la carte. 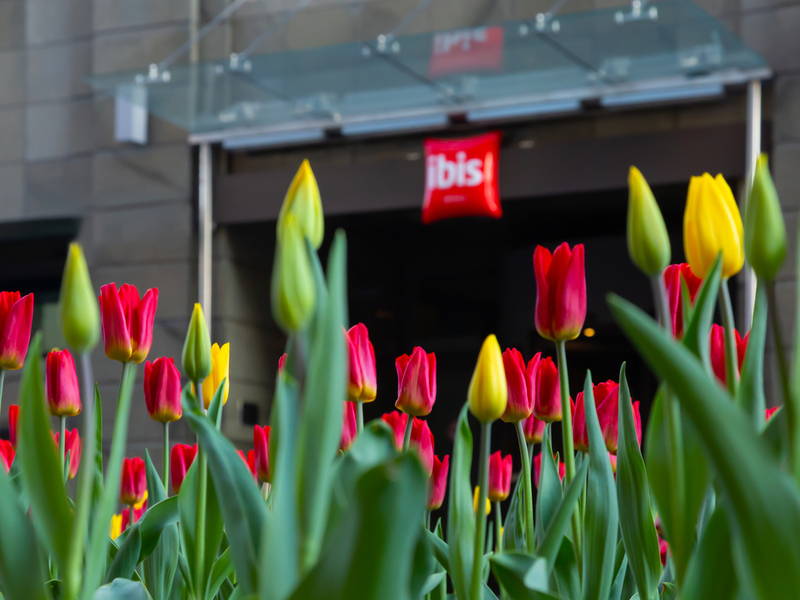 Meal time throughout your stay means the chance to discover the culinary stops of our ibis restaurants, ready to receive you 7 days a week, 365 days a year, every night open at least 7.00 pm. to 10.30 pm. The bar is the perfect place to relax at any time of day. There is no advantage to be a platinum Accor member in this hotel. So poor check-inn like never before in this or other places. The staff is trying to "manage" your credit cards. Unfriendly environment and unpleasant stay. Breakfast "fair". Before 10:00 you can expect missing bread on your table. Get ready, that the staff will try to "increase your credit" in the hotel when they see, that your consumption in the restaurant or at bar is significant. They will not ask your permission. They will simply try to make your deposit declared by check-in larger. Fortunately the bank did not allow this activity. The hotel is relatively far from transportation stations. The process of ordering the taxi using the help of reception takes some minutes and many questions were asked. No upgrade for platinum member was offered ever. Tea and coffee in the room, which is a standard complementary treatment for platinum member in every Ibis around the world is not available in this hotel. A water complementary in the room is given only one time at arrival. later you shall buy. I had a feeling, that I am not a guest but only a small number there. The people working there some months ago were not anymore visible, so fluctuation is high. In this case you get only basic treatment as the people are new and without experience I was there several times there previously but due to bad experience I change the hotels for some months. This time i gave another try ( due to proximity of the meeting place). Finally I decided : never again Price in comparison with other hotels from Accor is calculated from the moon ! Nothing special for relatively high price. Do not go there ! Choose another hotel ! Comfortable room, great service, lovely breakfast, modern design. Overall, I was very happy with the stay. The standard of the room and breakfast were higher than I expected. The hairdryer could have been more powerful. Also, I was given fresh towels everyday, even when I hung them on the hooks. I would prefer to use the same towels in order to reduce the environmental impact of washing them (as was written on the card in the bathroom). Nice hotel but room to hot,with no aircon in winter. We have stayed in this hotel before in the summer had a great time,but in winter not so good,as the first night the room temperature was 28%c, the next day reception sent a engineer to fix it, but told us the lowest the hotel can go is 24%c & the aircon can only work in the summer,this is still to hot for us,but by opening the window & only having a sheet on it was better,but you did hear noise from the street. Nice, clean, no problem, close to the center. highly reccomend. Comfortable, close to centre of Moscow, good price/quality ratio. I'm a repeated guest. Everything was OK, from staff to cleanliness, comfort, location and price to quality ratio. Some remarks about breakfast (low assortment) and menu (dinner) - doesn't chance. The main remark - your hotel computer system still doesn't have the address of my company (for the invoice) in the memory. I like Ibis hotel, because if it is possible they give for customers more. I became to keep my bag in Ibis reception in early October morning. They kindly give me my room at 8 a.m., even i book it from 2 p.m. I was very satisfied with my stay except for a significant difficulty encountered while checking in. I was asked to produce the debit card that had been used to pay for my stay. I was unable to do this because I had to destroy the card following the recent data breach at British Airways. (Presumably there would have been a similar difficulty if the card had simply expired and been destroyed.) I explained this to the check-in staff but they continued to insist that I had to present them with evidence that I owned the card that was used for the booking. Fortunately I am registered for online banking, and I was able to connect with the hotel wifi on my iPad and log into my bank. I never normally use online banking via the iPad and it was pure chance that I was able to find the login details. I managed to search for the payment transaction, which (again by fortunate chance) included the card number in the transaction details. I showed this to the check-in staff and they then agreed to check me into the hotel. I strongly object to being forced into logging into my bank over a public wifi network - something that i would never do under normal circumstances. I also object to having to disclose details of my private banking transactions to the Ibis hotel staff. I fail to understand why the staff insisted that they had to see the card that had been used for payment. They already had proof of my identity (passport), which could be matched with the information I provided when making the booking and requesting visa paperwork. And I could show them the hotel booking acknowledgement in my email. Also, the hotel stay was already paid for in full and no money was owing. I have been using Accor hotels for some years and do so regularly in the UK. I am not normally required to produce the bank card that was used to pay in full for a booking. I appreciate that rules may be different in Russia, but if so, there should be some provision for dealing with circumstances where the card cannot be presented. This is a systems failure in your operating procedures which needs to be addressed. Very nice location - close to the train depot, metro station and city center. Rooms to Ibis standard, nice and big bathroom. Perfect breakfast. Overall - certainly a hotel I can recommend, especially given the reasonable prices! - wifi not working good in room. - room was smaller and older than in other Ibis hotel (moscow), my previous stay)- on check in I again needed to say to talk with me in English, instead in Russian with my wife. Without saying I was totally without informations about hotel and room. Staff were friendly and helpful. Rooms were clean, modern and a good size. Buffet breakfast was great with a range of options to choose from. Water bottles were provided in the room too. Location was convenient being easy walking distance to the metro (only a couple of stops to Red Square) as well as to the train station (which we used for getting to the airport). We enjoyed our stay and would happily stay here again in future. I enjoyed the stay at Moscow Ibis Center hotel. All the services were OK.
Never again in this hotel as Platinum Guest and Favorite Guests are not taking seriously as they should be. Young staff with poor skill except some very friendly. Food at restaurant is so so. Better to be in the Noisy room even though at high floor. Mercure in same building but of course not same price. Really very disappointed by any refund in Accor points. Nice, clean hotel in a good neighborhood. Walkable to the Kremlin complex and downtown. Breakfasts are large and very tasty with a big selection of cooked and fresh foods. Everyone at the front desk was very helpful. Restaurant on premises was very handy with good food and good bar.